As soon as I heard the founder of AK Makeup Anna Karapetayan would be showcasing some of her signature South Asian bridal hairstyles I knew I had to attend The South Asian bridal beauty workshop! 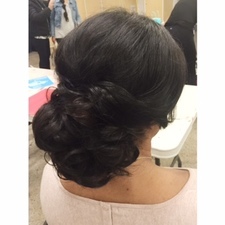 Anna is renowned for her polished hairstyles and diverse skill set that allows her to create beautiful bridal beauty on women of all ethnicities and cultures. I felt extremely fortunate to be a part of Anna's sold out workshop as it will be her last for a while as she awaits the birth of her first child. 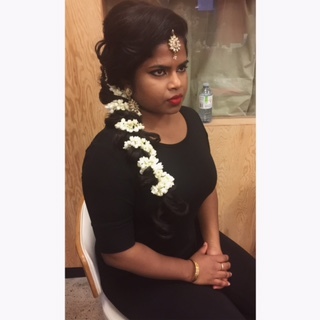 Anna demonstrated two different South Asian bridal hairstyles at the workshop the first style (see photo below) is one of her favourite and most requested styles a luxurious side braid draped and decorated with jasmine flowers. In the workshop, Anna shared great tips and advice on how to achieve the glossy flawless finishes that are evident in every Instagram picture she posts! Some great advice I took from the day was her emphasis on educating her brides on how important their hair preparation in the 24 hours leading up to their event is. Her brides receive detailed instructions about the hair preparation required to achieve the optimum results! With all the excitement the night before the wedding hair prep can be the last thing on your bride's mind. From a stylists perspective trying to achieve the perfect style on wet or unclean hair can be difficult, to say the least! Educating and explaining to the bride about the importance of hair preparation and providing more specific instructions about the limitations that wet, oily or unprepared hair could potentially have on their wedding day hairstyles is advice that really resonated with me and I will definitely be updating Bridal Hair Collective's preparation guide for all our 2016 brides to be! The South Asian bridal beauty workshop was presented by Elevating Artists.